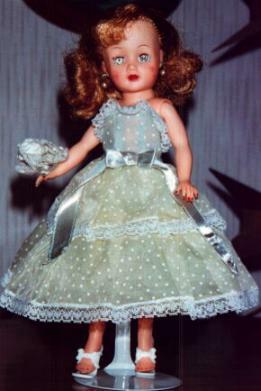 Ideal doll company released Little Miss Revlon in 1958. I started collecting these wonderful 10 1/2 inch dolls when I found a lovely mint brunette and a trunk full of clothes at a house sale. Little Miss Revlon dolls are marked Ideal Doll 10 1/2 VT on the back of the neck and have swivel waists and high heel feet. The dolls are very well made with rooted hair and sleep eyes. 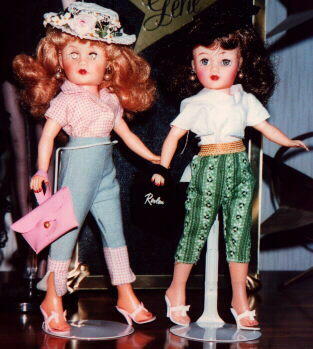 Ideal also released many different outfits for these dolls from 1958 through 1960. Original outfits should be tagged with Ideal Little Miss Revlon's name. My very first Little Miss Revlon, my lovely brunette. She wears a tagged Little Miss Revlon outfit complete with hat and purse. Next I added a gorgeous redhead to my collection. She wears a tagged Revlon outfit complete with hat and purse. To complete my collection of the three different hair colors, my blonde. She also wears a tagged Revlon outfit with fur hat and muff. Another tagged Revlon dress in a dotted swiss fabric. The brunette wears a tagged Revlon capri pant outfit and the blonde (a Revlon look a-like doll) wears a tagged Miss Ginger capri pant outfit. 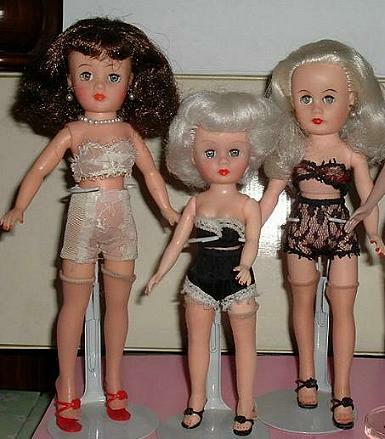 Little Miss Revlon on the left in her original white lingerie shown with a Little Miss Ginger in the center and Miss Coty on the right, another doll very similar to Little Miss Revlon.